The state Democratic Party and Missouri military veteran Darrell Cope of southern Missouri’s Hartville have filed a lawsuit in response to Governor Parson appointing fellow Republican Mike Kehoe to the lieutenant governor’s position. In court documents obtained by Missourinet, the lawsuit requests the Cole County Circuit Court in Jefferson City to declare that the governor does not have the authority to appoint someone to the elected position. The party wants to require the position be filled by voters electing someone to the spot. On Monday, Parson announced the appointment of Kehoe, the Senate Majority Floor Leader of Jefferson City. 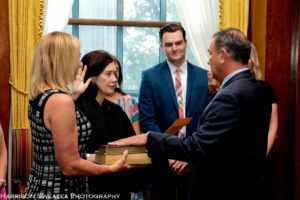 After the announcement, Kehoe immediately took the oath of office. Many lawmakers and their attorneys have been studying to see if the governor has the authority to appoint someone to the elected position. The Missouri Constitution does not state a clear path for filling the office when it suddenly becomes vacant. Sen. Bob Onder, R-Lake St. Louis, indicates he’s in support of Parson’s move. Some Democrats support Kehoe taking over the office, including state Senators Jamilah Nasheed of St. Louis, Gina Walsh of Bellefontaine Neighbors and Kiki Curls of Kansas City, who all served with Kehoe. Former Governor Jay Nixon, a Democrat, said Monday on Twitter that the governor has the power to appoint someone to the post. Missourinet’s requests for comment from the Missouri Democratic Party for have not been returned.